The musical trio Kalakan, which means chatting in Euskara, emanate from the French Basque Country and specialise in both traditional and modern interpretations of Basque music. 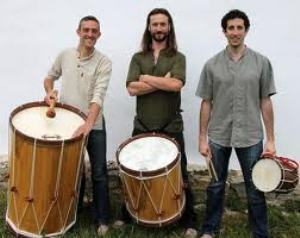 The three members, Thierry Biscary Ttirritt, Jamixel Bereau and Xan Errotabehere got together in 2009 to develop an interesting twist on conventional Basque music, often singing a capella and using sparse instrumentation, chiefly drums, pandereta (a large tambourine) and txalaparta (a traditional Basque instrument involving hitting small wooden batons on wooden planks placed on trellises to create a very atmospheric, echo-like effect). 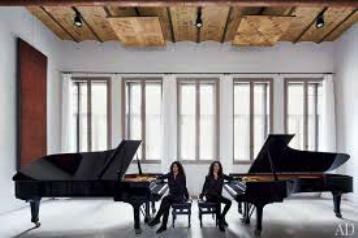 They had already been on tour and recorded with the well-known pianist sisters from Bayonne (Baiona), Katia and Marielle Labèque, who count no less a celebrity than Madonna among their friends. It was while visiting the sisters at their house near Bayonne in summer 2011 that Madonna was introduced by the sisters to the members of Kalakan. The story goes that she was at the sisters’ house to celebrate her 53rd birthday on 16th August and that very night the band performed their version of Ravel’s Bolero – at the house. Being duly impressed, Madonna then invited them to take part in her upcoming MDNA Tour. Over the course of 3 months of rehearsals in New York from March to May 2012, the band put together several arrangements of Madonna’s hits and traditional Basque songs, The actual tour kicked off in Tel Aviv on 31st May 2012 and 88 concerts in total were performed in Asia, Europe and North and South America – Madonna’s longest tour to date. On tour, Kalakan performed Gregorian chants, sang backing vocals and played their usual instruments, with perhaps their most curious participation being during Open Your Heart, which includes a sequence in which Madonna actually sings a little bit of the popular song Sagarra jo! in Euskara – not bad for 3 guys from the rural French Basque Country! By the way, they continue touring as a trio and gave a fine concert in San Sebastián’s Kursaal Auditorium in early April 2012.